Coconut Shrimp Curry with vegetables, a super quick and easy recipe that is low carb and gluten free. It’s packed with fantastic flavours, and it’s definitely one of my favourite comfort food recipes for the cold weather ahead. 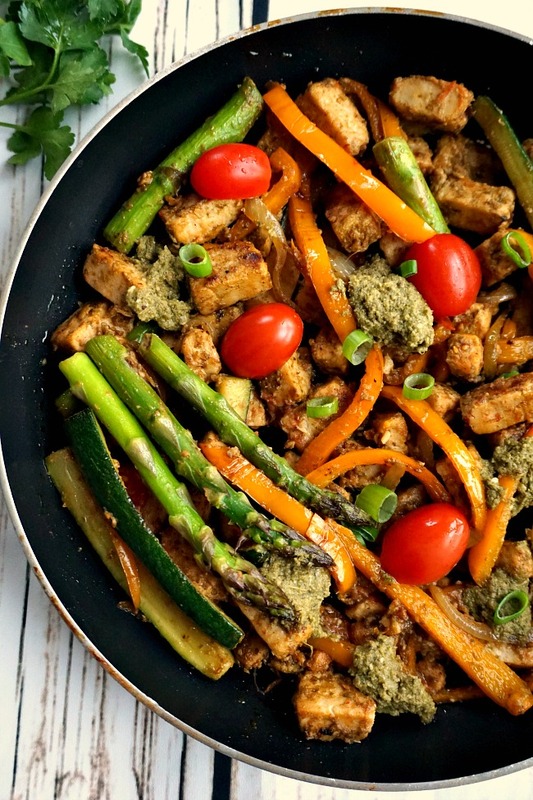 You gotta love quick and easy dinner recipes! 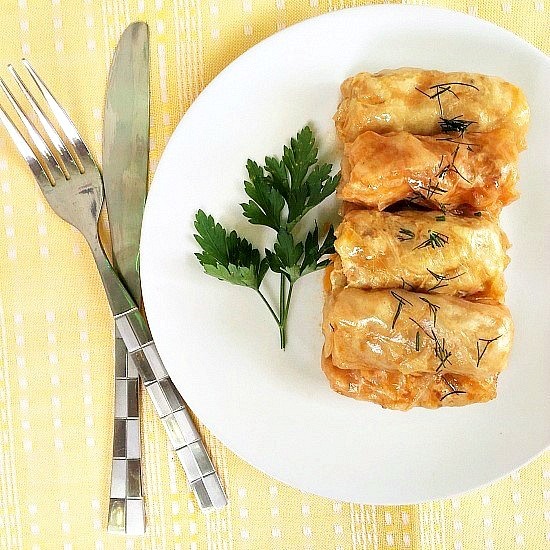 Isn’t it great to just be able to come up with fantastic dishes in just 30 minutes? It might still be warm enough outside to keep you out of the kitchen, but this easy shrimp curry doesn’t need much attention from you. No unnecessary stirring, just throw the veggies in with the chicken stock and coconut milk. Then add the shrimp just a few minutes before the coconut curry is ready, and that’s it. The vegetables I used make a delicious combo that goes so well with the warmth of the spices and the sweetness of the coconut milk. 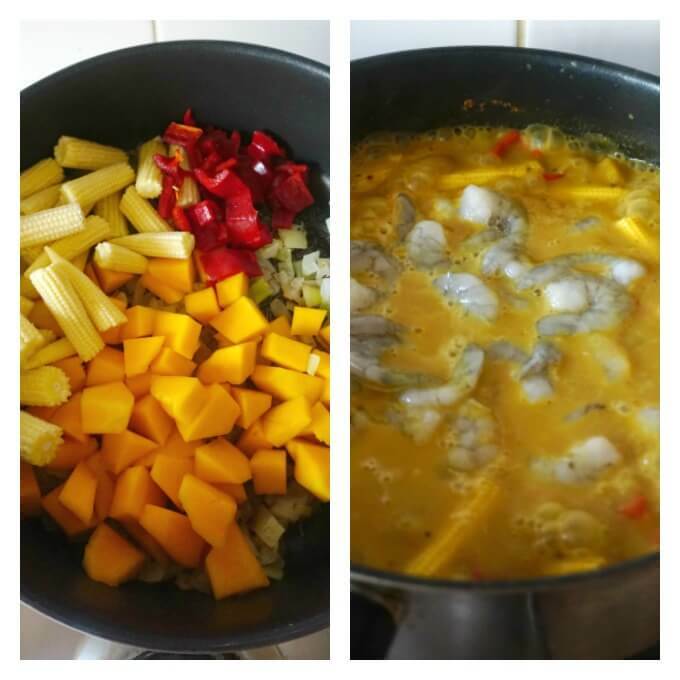 Butternut squash, baby corn and red pepper; not only you get a colourful dish, but also big flavours. What kind of coconut milk can be used for curries? The best option when it comes to coconut milk is the canned one you find in most shops. It’s pretty cheap, creamy and flavourful, as opposed to the drinkable coconut milk, which is pretty tastless and watery, if you as me. The canned coconut milk needs to be shaken before you open it, as the cream is usually separated from the rest of the liquid. Some recipes call from the coconut cream only, in which case you need not shake it, but for this recipe, we need it all. I like the curry with a bit of liquid in, but if you want it thicker, you can add some cornflour (corn starch) to it. 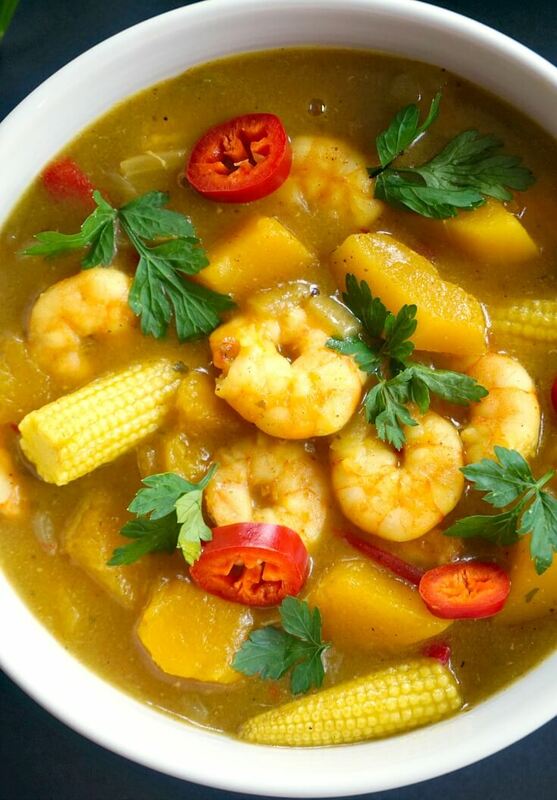 When do you add shrimp to the coconut curry? Shrimp cooks super quickly, it doesn’t need more than 3-4 minutes, so it’s added towards the end. Do not overcook shrimp as it will become quite rubbery and hard. If you use ready-cooked shrimp, throw it in, then take the pot off the heat, no need to extra cooking at all. 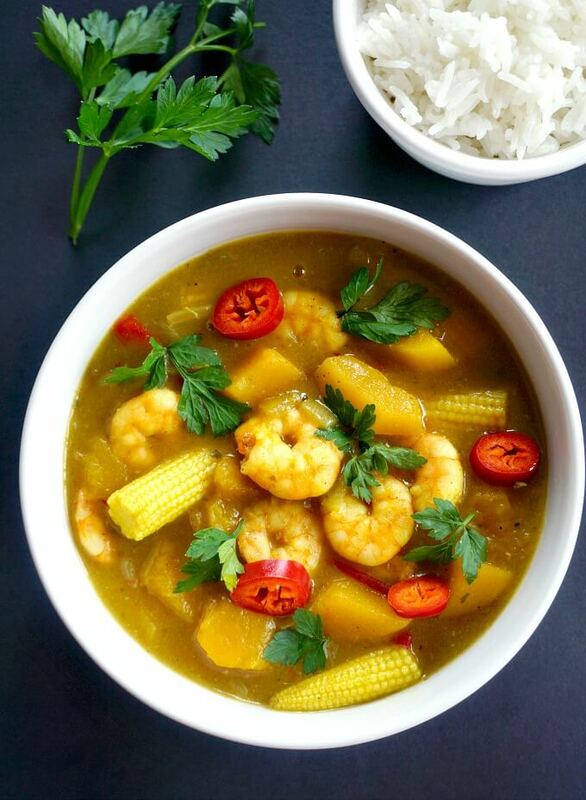 How do you make shrimp coconut curry? I admit I usually go for prety mild curries, as I don’t handle the heat too much if I go crazy with chillies. But you can add as much or as little chilli peppers as you like. My coconut shrimp curry is more of an Indian curry recipe, although I usually make the dish my own and use spices to my taste. 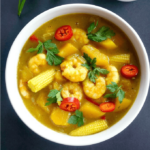 If you’ve tried my COCONUT SHRIMP CURRY RECIPE or any other recipe on the blog then don’t forget to rate the recipe and let me know how you got on in the comments below, I love hearing from you! You can also FOLLOW ME on FACEBOOK, INSTAGRAM and PINTEREST to see more delicious food and what I’m getting up to. Coconut Shrimp Curry with vegetables, a super quick and easy recipe that is low carb and gluten free. It's packed with fantastic flavours, and it's definitely one of my favourite comfort food recipes for the cold weather ahead. In a pan, heat up the oil, then peel and chop the onion and garlic, and fry them gently for about 3-4 minutes until soft. Add the ground coriander, cumin, turmeric and curry powder, and stir. Add the butternut squash, baby corn and chopped red pepper, pour in the vegetable stock and coconut milk, and leave to cook for about 15-20 minute until the vegetables are soft. Now the shrimp can be added too, but don't leave to cook for more than 3-4 minutes, otherwise the shrimp will become rubbery and hard. 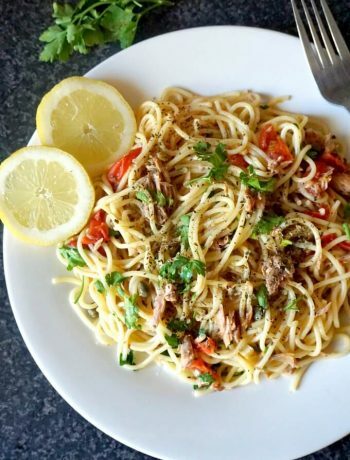 Season with salt and pepper, add the chopped chilli pepper and parsley, and remove from the heat.